Always setting your glasses down and forgetting where you left them? Put those days behind you with our handy Eyeglasses Case! 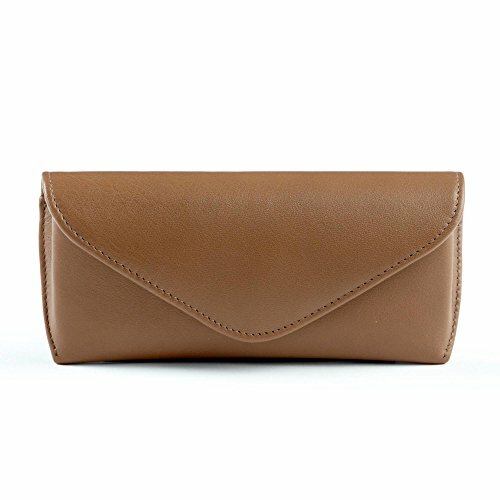 Made from genuine leather with pig suede interior, this stylish case has a large compartment to store eyeglasses of any size. The soft inside lining keeps your glasses gently cushioned and prevents scratches. The inside also has a leather covering piece to keep your glasses in place. On the outside is a magnetic snap closure that keeps your glasses securely in the case at all times. This glasses case comes in a gift box and can also be monogrammed, letting you add a personal touch. If you're tired of your glasses disappearing, our eyeglasses case is just what you need to always keep them in their place! Casual yet distinctive, our Timeless collection is one of our favorites. This leather boasts a polished finish and a soft hand feel, making it a great choice for any leather connoisseur. And with the variety of colors it comes in, it's easy to find a shade that appeals to you or matches with your other accessories. As the name implies, our Timeless collection will hold up through years of use while aging gracefully every step of the way. Please note: textures in this collection range from light grain to a lightly pebbled grain depending on which part of the hide it's from.